A new version of SQLite Forensic Reporter, Universal SQLite database examination tool is available, version 2.2 now includes more features to analyse, extract and report on information from any SQLite database (not corrupted or encrypted). glossary.rtf file is editable from the styles folder. A new version of SQLite Forensic Reporter, Universal SQLite database examination tool is available, version 2.1 now includes more features to analyse, extract and report on information from any SQLite database (not corrupted or encrypted). Added: main report page containing links to separate reports is now generated. 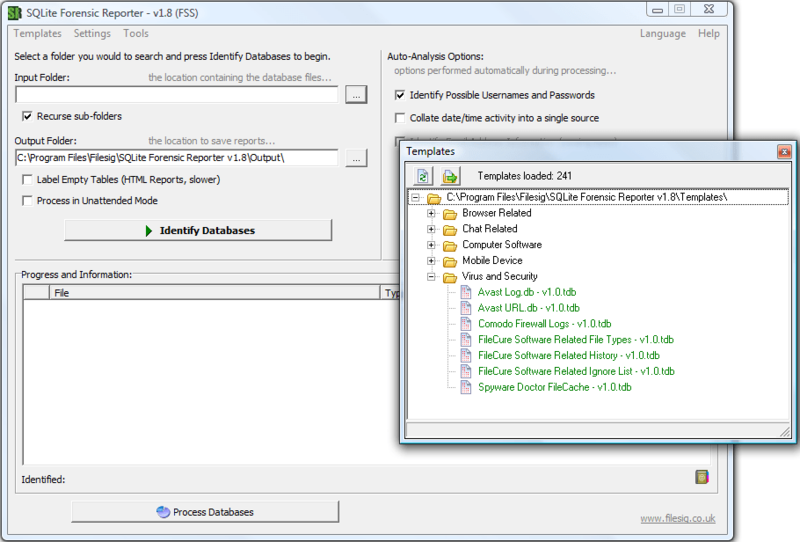 A new version of SQLite Forensic Reporter, Universal SQLite database examination tool is available, version 2.0 now includes more features to analyse, extract and report on information from any SQLite database (not corrupted or encrypted). Added: style sheets can be used on all html based reports generated by SQLite FR giving greater control of appearance to the user. Added: user can add there own custom header to the html reports. Fixed: templates present with sub-folders did not process the custom columns. A new version of SQLite Forensic Reporter, Universal SQLite database examination tool is available, version 1.7 now includes more features to analyse, extract and report on information from any SQLite database (not corrupted or encrypted). Additional improvements to the software and some fixes to improve usage. More templates added!!! A total of 241 templates are now available with more to come. Zip Forensics is a forensic software utility for batch analysis of both live and recovered zip files. This utility will automatic identify and analyse complete and partial zip files (upto 10% of original file). Specifically for MS Office 2007 and above formatted documents, spreadsheets and presentation files (DOCX, XLSX and PPTX). Identified files will be renamed and copied to a separate folder to allow them to be opened using a native viewer MS Office or OpenOffice. picture file data is required to be opened and viewed in a particular viewing program. Contacts.edb Extractor, a tool designed to extract information contained within the Windows Live Messenger (WLM) contacts file (contacts.edb) file. Windows Photo Gallery Viewer (WPG Viewer), is a tool designed to view and extract information contained within the Vista Windows Photo Gallery data file (pictures.pd4). Simple Carver, basic data recovery software, the first tool released starting this suite! Structured Storage Extractor is a utility for reading and extracting information from the Structured storage format (ole container) files. WinHex POS Viewer, a new tool to view and extract the content of POS files (Winhex search results) used by the Winhex program. Useful if you need to use the results from a previous search within a third party tool. WMDB Extractor, a tool designed to extract information contained within the Windows Media Player data file (CurrentDatabase_360.wmdb). Extracts playlist, video, music and photo information to CSV, HTML and Text file report formats. PicViewer Extractor, is a tool designed to view and extract information contained within the PicViewer picture browser thumbnail cache file. Windows Live Photo Gallery Viewer (WPG Live Viewer), is a tool designed to view and extract information contained within the Vista Windows Live Photo Gallery data file (pictures.pd5). Simple Carver Suite costs $95 per license and includes all the above tools, includes free customer support and updates.